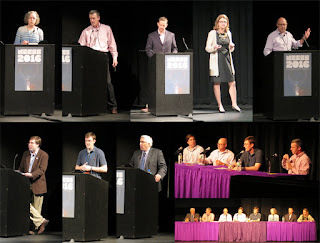 May 13-15 marked the eighth annual Northeast Conference on Science and Skepticism (NECSS). This was the sixth time I've attended, though I almost skipped this year (more on that later). For those who have never attended, NECSS is a joint effort by the New York City Skeptics and The New England Skeptical Society. The conference, once more held at the Fashion Institute of Technology, fills three days of science, critical thinking, and education for attendees on a wide range of subjects. Some topics are geared toward the general public, while some sessions are more introspective, looking at the skeptical community itself. 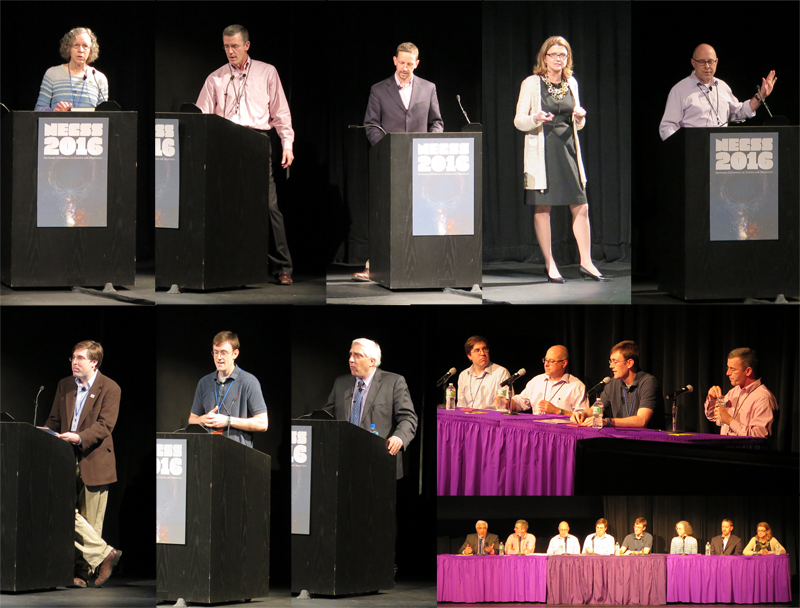 If you weren't able to make it, don't worry; videos from the conference will be posted on the NECSS YouTube channel. You can also get a taste of previous years' conferences from my reviews of 2011, 2012, 2013 (part 1 and part 2), 2014 (part 1 and part 2), and 2015 (part 1, life unfortunately intervened, so I never got around to writing up days 2 and 3). As always, I like to take this time to summarize what skepticism means, at least to me. Many people have a caricature image of skepticism in their minds as people who simply reject things out of hand, arguing against things simply for the sake of disagreeing. Contrarian would be a better word to describe that. Skepticism, on the other hand, doesn't have to do with what you think, or just dismissing things that you don't agree with. It is how one approaches the world. Skepticism involves questioning claims and investigating evidence to see where it leads, always open to the possibility that what we may have thought was true is actually wrong. When we read something on the internet, whether it's the latest celebrity gossip or questions on the nature of the universe, we use skepticism to evaluate the claims and weigh the quality of the evidence. Skepticism isn't just critically examining others' claims, though. It's also taking a critical look at our own beliefs, and a willingness to change our beliefs to match the evidence, rather than trying to fit reality to our beliefs. As for the skeptical community, we're just normal people from all backgrounds. It's the way that we examine the world around us that brings us together. Now that that's out of the way, how was this year's conference? As with last year, Friday was a full day devoted to science-based medicine. While last year's talks took a more introductory tack, this year focused on slightly more advanced topics. Dr. Harriet Hall opened the morning and her talk on functional medicine with a tribute to one of the original authors at the Science-Based Medicine Blog, Dr. Wallace "Wally" Sampson, who passed away last year. Dr. Hall recounted how Wally described functional medicine (FM) as IBTHOOM (It Beats The Hell Out Of Me), since even the promoters of functional medicine have such a vague definition that could describe conventional medicine just as well. The main difference, according to Dr. Hall, is that FM incorporates quackery and real medicine, though its practitioners often claim that diet alone is enough to treat disease, while also arguing that "normal" is not enough; we must strive to go beyond normal. Dr. Grant Ritchey, one of the hosts of the The Prism podcast, then took us into the world of dental quackery, from amalgam fillings and fluoride myths to other fringe practices, like "toxic" root canals, acupuncture to treat dental issues, and oil pulling. One of the more amusing examples he shared was cranial osteopathy. Practitioners claim they can treat dental issues by shifting the bones of the skull, when they really just move the soft tissue around. If the bones of the skull really were being shifted around, the patient would suffer severe trauma, since the bones are a) fused together quite strongly and b) interlocked by many intricate turns along the edges. Demonstration of cranial osteopathy. Practitioner claims he is moving the skull bones. Staff in Dr. Ritchey's office, with no training, show it's just the soft tissue moving. One of the more interesting talks of the morning came from pharmacist Scott Gavura, discussing dietary supplements. Talks on dietary supplements usually go into the questions of safety and efficacy of these products. What made Gavura's talk different was that he went into the pharmacokinetics of herbs, vitamins, and other supplements, that is, how the body absorbs, distributes, metabolizes, and eliminates (ADME) substances. Some supplements, like curcumin (from turmeric), are poorly absorbed and rapidly eliminated, while others, like St. John's Wort, can interact with other drugs, resulting in lower efficacy or increased risk of adverse events. Attorney Jann Bellamy took the legal side of dietary supplements, discussing the legislative and cultural history of supplement regulation. The current state of regulation is largely due to lobbying efforts by supplement manufacturers, coupled with propaganda commercials starring big names like Mel Gibson. After lunch, emcee Jamy Ian Swiss did his usual schtick of doing a magic trick to welcome people back for the afternoon sessions. Surprisingly, it was the only magic he did during the conference, but still felt a bit old. I've mentioned before that the conference could use someone different to serve as emcee. At any rate, the first talk of the afternoon was Dr. John Snyder. Dr. Snyder covered the risks of mixing quackery with pediatric care, citing examples from Northampton Wellness Associates (NWA), a Complementary and Alternative Medicine clinic near his practice. A common feature of these cases are a staggering battery of lab tests on these children that are not indicated by any clinical features. Treatment frequently involved supplements (sold by NWA), as well as real drugs to treat nonexistent illnesses. Dr. Snyder's overall style was especially engaging, using humor to keep the audience engaged. Pediatric infectious disease doctor, Dr. Saul Hymes, then led us into the world of Lyme disease. This talk held particular interest for me, considering my own brush with the disease. Dr. Hymes taught us about how the disease is diagnosed, what it does to the body, and the controversy around post-treatment Lyme disease (not to be confused with the fictitious disorder called Chronic Lyme Disease). You can read a more in-depth discussion of The Crack Heard Round the World over at Science-Based Medicine. Finally, Dr. Steven Novella wrapped up the individual talks with an introduction to Bayesian statistics. He emphasized how much of medical science relies too heavily on p-values, ignoring the prior plausibility of the hypothesis. While a Frequentist approach to research tends to examine hypotheses in somewhat of a vacuum, a Bayesian approach looks at the hypothesis in the context of what we already know (i.e., prior plausibility) and modifies the prior plausibility based on the results of the research. The day closed with a panel discussion on whether doctors should "fire" patients who refuse to vaccinate their kids, and a Q&A for all of the SBM speakers. Some highlights coming out of this are that doctors probably should not fire patients, but rather try to educate them. We also got ideas for how to advocate for science-based medicine (Dr. Snyder mentioned that his waiting room has a laminated flipboard of reliable web sites), how to respond to "it worked for me" (acknowledge that you're happy they're better, but also ask why they think it worked), and what the ideal regulation is for supplements. And last of all, we learned that parents who fall for quackery, even if they mean well, can unfortunately open themselves up to accusations, and even convictions for, medical child abuse. 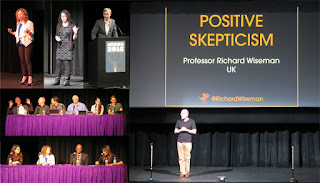 An added bonus on Friday night was the Skeptical Extravaganza of Special Significance, hosted by the crew of the Skeptics' Guide to the Universe, with emcee George Hrab and special guest Bill Nye. This was a fun, relatively loose sort of variety show culminating in an audience vs. SGU trivia contest. While is found last year's extravaganza to have a better pace and energy, it was still a fun way to end the day. The next morning, I headed a couple blocks down to the Malibu Diner at 163 W. 23rd St. for some breakfast. I've eaten here pretty much every year the conference has been held at FIT. The food is good, service is fast, and the staff are incredibly nice. Every time I've been in there, they welcome the regulars, including several different blind customers. After breakfast, it was back to FIT to hear Dr. Deborah Berebichez, physicist and STEM advocate. She spoke on how ideas can be basically approximated in terms of reasonable or outrageous, true or false. Washing hands to prevent disease is reasonable and true, while the idea that vaccines cause autism is outrageous and false. But where an idea falls into the grid can change over time, as new evidence surfaces. The idea that vaccines cause autism was, at one time, a reasonable, though false, idea. Hand-washing to prevent disease was once outrageous, though true. Reasonable but false and outrageous but true areas challenge our skeptical outlook. Next up, Dr. Shari Berkowitz discussed the fallibility of memory and how the judicial system lacks sufficient scientific inquiry. She noted how memories can change and how people can be made to remember events that never happened, whether by suggestion or by the person telling a lie enough times that they eventually believe it to be true. This can cause trouble in the courts, since witnesses may implicate the wrong individual, and innocent suspects may even confess to a crime they did not commit. Dr. Berkowitz calls for scientists to educate the courts, and reminds us to look at all of the evidence, how reliable and accurate it is, and whether the source of the evidence is independent. Last year's keynote speaker, Bill Nye, returned this year to talk about science advocacy and an upcoming documentary about him titled Change the World. Although science denialists have been very successful, Nye urges us to remain optimistic and be confident that we can overcome the denialists and make a positive change in the world. As Nye said, "Now I'm talking to adults, and I'm not mincing words." After lunch, the crew of the Skeptics' Guide to the Universe had their live NECSS show that serves as a tribute to Perry DeAngelis, one of the co-founders of the New England Skeptical Society. Then it was on to a panel featuring Dr. Berebichez, Rachel Crane, and Dr. Hussein Jirdeh, moderated by Jennifer Lopez. Though listed as being about diversity in science and space exploration, the panel focused mainly on diversity in STEM in general. There are still a lot of barriers to gender and racial minorities, which is unfortunate, since creativity and innovation thrive when people from many different backgrounds are involved. Students need to be able to see themselves in science advocates and educators. Much of what was discussed we've heard before, which highlights why this is such an important topic, and how we still have a good fight ahead of us to increase diversity in science. The afternoon presentations ended with this year's keynote speaker, Prof. Richard Wiseman. This was truly a treat, as Prof. Wiseman is an amazing speaker and entertainer. With a blend of magic, humor, and science, he showed us how our brains make shortcuts, seeing or hearing what isn't there. We essentially trick ourselves. It's very easy for us to get bogged down in countering misinformation, falling into a negative approach. 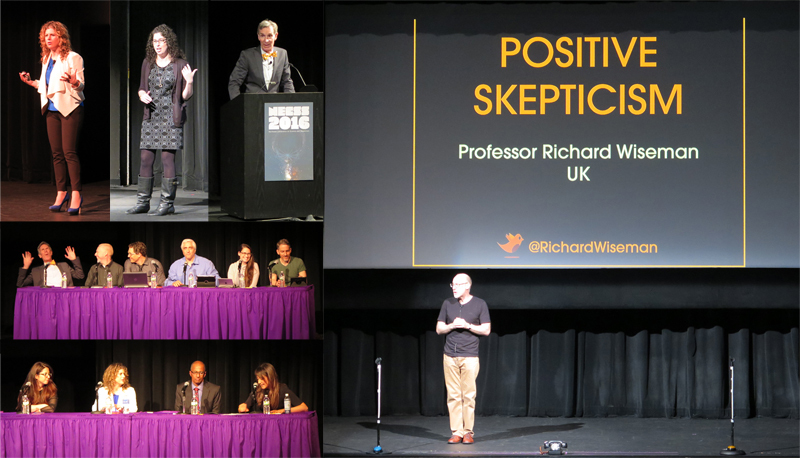 Prof. Wiseman reminds us that we can be positive, and that science and skepticism are amazing ways to reach youth. He followed his talk with a "show without a performer", titled Experimental. The audience essentially drives the show by making choices at several points. It combines psychology, magic, and whimsy. There was so much in this show that words can't do it justice. Suffice to say that it engaged everyone in the audience and had us laughing together. After the conference, the Secular Coalition for America sponsored a free reception for all NECSS attendees. Normally, the conference holds a fundraising reception to help defray costs and fund future conferences as an opportunity to meet and talk with the presenters. While it was welcome that this year's reception was free (including a free drink ticket for each attendee), it really amounted to Drinking Skeptically with an added lobbying rally thrown in. It was still a fun evening, including some science/skepticism-themed trivia. I used the opportunity to hang out with some friends and make some new ones. Yvette d'Entremont, aka SciBabe, opened the last day of NECSS with primer on some of the mistakes that skeptics, including herself, make. People who have been in the skeptical community for a long time likely knew most of what she discussed, but hers was a good introduction for those who are relatively new to skeptical activism. It's very easy to fall into a sort of cult of personality, launching ad hominems at writers we don't like rather than addressing their content. We also need to be wary of going from skepticism to cynicism, avoiding confirmation bias, argument from authority, and not doing our research. Maria Konnikova then took us into the world of the confidence man, using the example of Ferdinand Waldo Demara, a man who successfully conned people, even when they knew he had lied to them. He exemplifies the features of a successful con artist: psychopathy, narcissism, and Machiavellianism. These traits allow the con artist to coldly analyze others, giving them the appearance of being a good listener; justify his actions; and manipulate people into thinking that it was their own idea to take whatever action benefits the con artist. Konnikova was the only speaker that did not use slides, engaging the audience only through powerful storytelling and a tone of voice that made you sit up and listen. Climatologist Dr. Michael Mann spoke about his upcoming book, The Madhouse Effect. Dr. Mann teams up with political cartoonist Tom Toles to tackle climate change denialism through satirical cartoons. He showed a number of cartoons illustrating various points that hit home against those who question the role of humans in global climate change. Unfortunately, the images were often too small to read from further away than the first several rows of the auditorium. Nonetheless, The Madhouse Effect looks like it can be an effective tool to address deniers' claims...if only they would read it. The last speaker before lunch was Jennifer Lopez, Commercial Innovation Technology Development Lead at the Center for the Advancement of Science in Space (CASIS). Lopez noted that the International Space Station is a national laboratory open to researchers. "We have a framework for discovery," she said. The ISS allows for experiments in microgravity that cannot be done on Earth. Julia Galef next hosted Rationally Speaking, with guest bioethicist Jacob Appel. The podcast was followed by a panel on free speech, social justice, and political correctness. Moderated by Brian Wecht, the panel featured Dr. Heather Berlin, Will Creeley, Yvette d'Entremont, and Julia Galef. A good portion of the discussion focused on sensitivities vs. free speech, and that while a person may have the right to say whatever they wish, they do not have a right to a platform from which to speak. Absolute free speech is a fiction. The panel came about as a result of what happened with Richard Dawkins. You can read about the background here. In my intro, I mentioned how I had nearly skipped attending this year's NECSS. That was due to their invitation to Richard Dawkins. However, it wasn't because of the video that Dawkins shared, but because of his long history of denigrating others and consistently failing to take responsibility for his words, choosing instead to dig himself deeper. I recognize that he has done a great deal to advance critical thinking, particularly in the field of evolution vs. creationism. However, he too frequently allows his ideology to drive his speech, doing more to divide the skeptical movement than to bring it together. Unfortunately, other than just a couple of passing comments, the panel did not address this at all. It would have been a far more interesting and worthwhile discussion if they had. I had to leave after the panel, so I did not see the final two talks of the conference, from Dr. John McWhorter, speaking on the disappearance of languages, and journalist John Horgan, on "hard" vs. "soft" targets of skepticism. Horgan did, however, publish his talk on Scientific American's website. Horgan's talk created a bit of a stir, garnering critical posts from Dr. Steven Novella, Orac, and Daniel Loxton, and a supportive post from PZ Myers. Horgan penned a reply to these responses in which he essentially claimed victory. His original talk had a grain of a point: skeptics should question not only those with whom they disagree, but also those with whom they agree. Unfortunately, he proceeded to stray from that point to attack strawmen. His rebuttal, likewise, boils down to an admission that he was doing little more than trolling skeptics for a reaction, rather than making a substantive point. Other than the couple of less-than-ideal presentations, I only have two other critiques. First, the conference could do with a new emcee. While Swiss may do an adequate job for newcomers, he feels a bit too predictable and lackluster. Second, raising the house lights could encourage greater audience engagement, particularly during panel discussions. At one point, an audience member asked for the house lights to be brought up, but was overruled by Swiss. Another journalist present also mentioned that the lack of house lights made taking notes very difficult, a feeling I share. Even one of the speakers was taken aback at stepping onto the stage and seeing only black. Even raising the house lights to half could help alleviate these issues and encourage greater audience engagement. 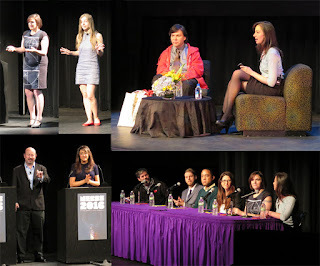 Overall, my criticism aside, this year's NECSS hosted some excellent speakers. As always, it was a great opportunity to learn new things, meet new people, and reconnect with friends. Keep an eye on the NECSS YouTube channel for videos from the conference. The amazing staff and volunteers that make NECSS a success.